From Figure-4, you can reconstruct all the possible paths which the frogs may have followed across your paddy. You are only interested in frogs which have landed on at least 3 of your rice plants in their voyage through the paddy. Such a path is said to be a frog path. In this case, that means that the three paths shown in Figure-3 are frog paths (there are also other possible frog paths). The vertical path down column 1 might have been a frog path with hop length 4 except there are only 2 plants flattened so we are not interested; and the diagonal path including the plants on row 2 col. 3, row 3 col. 4, and row 6 col. 7 has three flat plants but there is no regular hop length which could have spaced the hops in this way while still landing on at least 3 plants, and hence it is not a frog path. Note also that along the line a frog path follows there may be additional flattened plants which do not need to be landed on by that path (see the plant at (2, 6) on the horizontal path across row 2 in Figure-4), and in fact some flattened plants may not be explained by any frog path at all. Your task is to write a program to determine the maximum number of landings in any single frog path (where the maximum is taken over all possible frog paths). 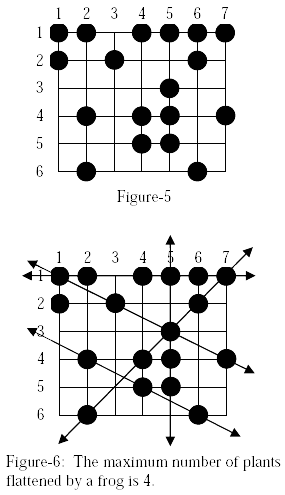 In Figure-4 the answer is 7, obtained from the frog path across row 6. Your program is to read from standard input. The first line contains two integers R and C, respectively the number of rows and columns in your rice paddy (1 ≤ R,C ≤ 5000). The second line contains the single integer N, the number of flattened rice plants (3 ≤ N ≤ 5000). Each of the remaining N lines contains two integers, the row number (1 ≤ row number ≤ R) and the column number (1 ≤ column number ≤ C) of a flattened rice plant, separated by one blank. Each flattened plant is only listed once. Sample Case 1 corresponds to the diagrams above.